Call 501-625-3850 to make a reservation today! Whenever you have a special occasion, think of The Avenue. The Avenue is available for complete rental (think company holiday party or rehearsal dinner) or we can section off an area for smaller groups (department celebration or bridesmaid’s luncheon). Chris Arrison, our “event concierge,” will show you all the options, handle arrangements and help make your event – small or large – truly special. With an award-winning chef to create a wonderful meal or hors d’oeuvre, your guests are sure to be impressed. And remember, if you need a block of hotel rooms for your guests, Chris can set that up for you as well. The Avenue is a 700 square-foot L-shaped room with original brick forming one wall and a large window across the front. There are approximately 10 high tops with chairs in the Lounge & Bar area, and 20 to 30 tables in the restaurant area – but come by and see for yourself. Let Chris and our team of event experts help you make your event unforgettable. The Waters and The Avenue have several spaces that might be perfect for your company event. The restaurant is available for rental. With this option, you not only receive a wonderful, private space to make your event truly special, you will also gain the services of our award-winning chef and restaurant staff. They can prepare and serve a full dinner, efficient luncheon or bounteous hors d’oeuvre and drinks. The Whippoorwill Room provides a quiet space for your Board of Directors, planning team or executives to meet for annual planning, marketing and sales presentations or any other business event. Snacks and sandwiches can be prepared and brought to you. Or break for a wonderful meal in the restaurant to give your group some time for team building or get to know one another. For specific information and a tour, contact Chris Arrison, Director of Sales and Events. The Avenue is the perfect venue for family dinners and reunions (large or small) as well as bridesmaid’s luncheons or wedding party dinners. You can rent the entire restaurant or just reserve a few large tables for lunch or dinner. We can help you or your wedding planner with decorations, gift bags, etc. Of course, Chef can prepare a special meal just for your group, or you can order off the menu. Remember, The Waters is the perfect hotel for your guests who may need overnight accommodations. We have room blocks available, but arrangements must be made in advance. For specific information and a tour, contact Chris Arrison, Director of Sales and Events for specific information, ideas and a tour. On the last Sunday of every month, The Avenue hosts a local or regional artist to exhibit and give a brief gallery talk. A five-course dinner is paired with specific wines for guests and the evening becomes a “salon” of the past when people came together to eat good food and enjoy the arts of the day. These unique dinners have consistently sold out since beginning last fall. 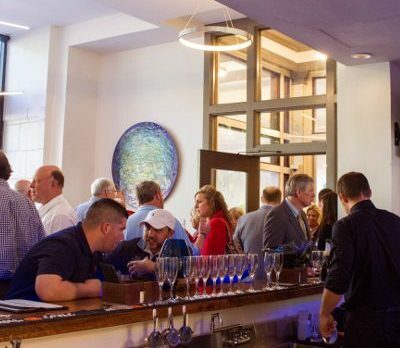 “Art, food, architecture, lifestyle and certainly hospitality are foremost on the list of great things about Hot Springs,” said Robert Zunick, one of the owners of The Waters and the organizer of The Avenue’s monthly Art & Wine Dinners. Each dinner will feature a local or regional artist—some of whom have work displayed in the lobby, hallways and rooms at The Waters—and give them the platform to briefly discuss their inspiration and technique. Then guests are treat to a five-course meal created by The Avenue’s executive chef, Casey Copeland. The prix-fixe pricing has ranged from $75 to $85 per person. For information and reservations, simply call The Avenue (501-625-3850). Valentine’s Day, New Year’s Eve, Easter Brunch and Mother’s Day are just some of the special event dinners we host each year. Chef Casey creates a special menu for these evenings or days that sell out quickly. For notification and more information, check The Avenue’s Facebook page or website. For more information or reservations, call The Avenue (501-625-3850). Chris Arrison, Director of Sales and Events, is here to help you have a wonderful meeting or event at The Avenue or The Waters. Tell Chris about your event and let him suggest ways to make it truly unique and personal. Contact Chris either by phone or e-mail.